In 1938, the location of the former trolley barns on Lalor St. was changed into a roller rink (Along with what is now the car wash). Any South Trenton old timer can probably tell you of many fun experiences at the rink. I (Mr. Mayberg) also went to the rink in 1985 during my first year of teaching at Dunn School. It closed soon after that visit. The rink has been used for other purposes or has sat vacant (Empty) for the past 30 years (except for any ghosts that haunt the place.) Recently, scaffolding has gone up on the front of the rink. It is being renovated (fixed) so it will become part of the car wash next door. It will include the vacuuming and VIP service sections of the car wash business. 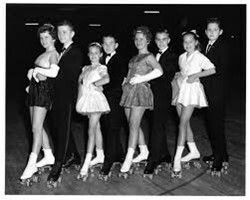 I guess that many kids would prefer it as a roller rink again, but the new building will bring in tax money to Trenton. So after a slumber for many years, the former roller skating building will once again be active. It will bring life to a building that has been an eye sore for many years .